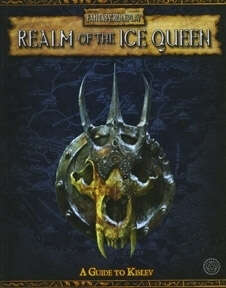 Caught between the sprawling Empire to the south and the maddening wastes of Chaos is Kislev, Realm of the Ice Queen. Legendary for its doughty peoples who stand fast against the ravenous hordes of Chaos spilling out of the north, who endure the incredible cold and the barren bleakness that defies their land and yet persevere, surviving against all odds. Yet, Kislev is more than appalling winters and endless struggles against Chaos; it is a rich land with a fascinating culture and history, with a proud people and prouder heritage. It may shield the softer men to the south, serving as the first line of defense against destruction, but it is fiercely independent, strong, and enduring. • A detailed overview of Kislev, with examinations of its history, politics and laws, and religions. • Geographical details, guidelines for surviving the oblast, and extensive information on Kislev, Praag, and Erengrad. • Everything you need to create and play a character in Kislev, including new careers, new magic rules, and pages of new spells. • A mini-adventure to kick-start your Kislev campaign. Kislev is a hard land but one ripe for adventure. Whether you're looking for the perfect battlefield to wage war against Chaos or Greenskins or gloomy streets holding countless mysteries and despicable crimes, Realm of the Ice Queen is the sourcebook for you. Stef Kopinski, Andrew Law, et al. This title was added to our catalog on September 24, 2009.